Michelangelo Antonioni’s La notte (1961) examines the turbulent marriage between a writer and his wife over the span of just under a day. The film begins with Giovanni (Mastroianni) and Lidia (Moreau) visiting a friend sick with cancer in the hospital. They seem civil enough to each other, but at one point she excuses herself and Antonioni cuts to a shot of her crying outside the hospital while her husband is aggressively seduced by a beautiful female patient. There is little question that this is a deeply dysfunctional couple. They attend a book party and while he’s fawned over she wanders through the crowd with a mixture of contempt and disgust on her face. Lidia eventually leaves and walks through the city streets in search of something. Like many of his films, Antonioni uses architecture and the actual physical space to illustrate the alienation of his characters. So, we get a shot of Lidia walking down a deserted city street and in another shot her being dwarfed by a modern building. 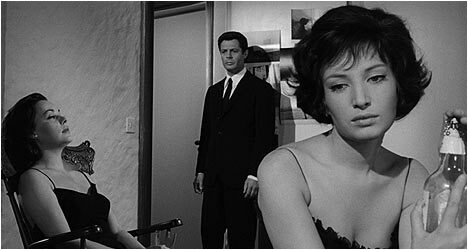 Ultimately, La notte is about bored, affluent people in the midst of an existential funk. Giovanni and Lidia are a couple that have fallen out of love with each other and while it is never stated explicitly, it can be felt in the almost palpable sense of estrangement that exists between them. This is expertly played out by Jeanne Moreau and Marcello Mastroianni. Throw in a seductive Monica Vitti, whose appearance marked the second of four collaborations between her and Antonioni (the others include L’avventura, L’eclisse, and Red Desert) and was his cinematic muse for a short, but incredibly productive time, as the daughter of the host of a party that Giovanni and Lidia attend, and you’ve got a powerhouse cast embodying emotionally challenged characters all masterfully orchestrated by the director. Film critic Adriano Apra and film historian Carlo di Carlo put La notte in the context of Antonioni’s career while also analyzing the film’s themes and its style, pointing out how it changed Italian cinema with its minimalism. Also included is an interview with professor Giuliana Bruno who examines the role architecture plays in La notte. She points out that it is like another character and explains how important it is right from the opening shot. The architecture not only mirrors the characters’ feelings, but also comments on cinema itself.